Ούτε κραγιόν ούτε lip gloss. Αυτή η ματ κρέμα χειλιών είναι ένα νέο είδος lip color, με μεταξένιο και ματ φινίρισμα. 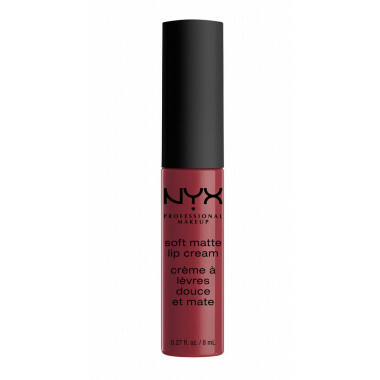 Η Soft Matte Lip Cream είναι εκπληκτικά ανθεκτική και σε αντίθεση με κάποιους τύπους ματ κραγιόν, προσφέρει και ενυδάτωση. • Τι είναι: Μatte κρέμα χειλιών με έντονο χρώμα. • Τι κάνει: Δημιουργεί διάφορα matte look στα χείλη. • Γιατί την αγαπάμε: Απολαυστικά κρεμώδης και ελαφριά, έχει δυο νέες μαγευτικές αποχρώσεις. • Πώς να τη χρησιμοποιήσετε: Εφαρμόστε απευθείας στα χείλη, ή πάνω από το κραγιόν. Εφαρμόστε με lip liner για να καθορίσετε το περίγραμμα των χειλιών. Isohexadecane, Pentaerythrityl Tetraisostearate, Disteardimonium Hectorite, Dimethicone, Beeswax/Cera Alba/Cire d’Abeille, Glyceryl Behenate/Eicosadioate, Talc, Cyclopentasiloxane, Propylene Carbonate, Silica, Methyl Methacrylate Crosspolymer, Aluminum Starch Octenylsuccinate, Dimethicone Crosspolymer, Phenoxyethanol, Flavor/Aroma, Benzyl Alcohol, Benzyl Benzoate, Benzyl Salicylate, Hexyl Cinnamal, Hydroxycitronellal. MAY CONTAIN / PEUT CONTENIR (+/-): Mica, Titanium Dioxide (CI 77891), Iron Oxides (CI 77491, CI 77492, CI 77499), Manganese Violet (CI 77742), Yellow 6 Lake (CI 15985), Yellow 5 Lake (CI 19140), Red 6 (CI 15850), Red 7 (CI 15850), Red 28 Lake (CI 45410). Isohexadecane, Pentaerythrityl Tetraisostearate, Disteardimonium Hectorite, Dimethicone, Beeswax/Cera Alba/Cire d’Abeille, Glyceryl Behenate/Eicosadioate, Talc, Cyclopentasiloxane, Barium Sulfate (CI 77120), Propylene Carbonate, Silica, Methyl Methacrylate Crosspolymer, Aluminum Starch Octenylsuccinate, Dimethicone Crosspolymer, Rosin/Colophonium/Colophane, Phenoxyethanol, Flavor/Aroma, Benzyl Alcohol, Benzyl Benzoate, Benzyl Salicylate, Hexyl Cinnamal, Hydroxycitronellal. MAY CONTAIN / PEUT CONTENIR (+/-): Mica, Titanium Dioxide (CI 77891), Iron Oxides (CI 77491, CI 77492, CI 77499), Manganese Violet (CI 77742), Yellow 6 Lake (CI 15985), Yellow 5 Lake (CI 19140), Red 6 (CI 15850), Red 7 (CI 15850), Red 28 Lake (CI 45410). Isohexadecane, Pentaerythrityl Tetraisostearate, Disteardimonium Hectorite, Dimethicone, Beeswax/Cera Alba/Cire d’Abeille, Glyceryl Behenate/Eicosadioate, Talc, Cyclopentasiloxane, Propylene Carbonate, Silica, Methyl Methacrylate Crosspolymer, Aluminum Starch Octenylsuccinate, Dimethicone Crosspolymer, Alumina, Phenoxyethanol, Flavor/Aroma, Benzyl Alcohol, Benzyl Benzoate, Benzyl Salicylate, Hexyl Cinnamal, Hydroxycitronellal. MAY CONTAIN / PEUT CONTENIR (+/-): Mica, Titanium Dioxide (CI 77891), Iron Oxides (CI 77491, CI 77492, CI 77499), Blue 1 Lake (CI 19140), Yellow 5 Lake (CI 19140), Red 6 (CI 15850), Red 7 (CI 15850), Red 28 Lake (CI 45410). Isohexadecane, Pentaerythrityl Tetraisostearate, Disteardimonium Hectorite, Dimethicone, Beeswax/Cera Alba/Cire d’Abeille, Glyceryl Behenate/Eicosadioate, Talc, Cyclopentasiloxane, Propylene Carbonate, Barium Sulfate (CI 77120), Silica, Methyl Methacrylate Crosspolymer, Aluminum Starch Octenylsuccinate, Dimethicone Crosspolymer, Phenoxyethanol, Flavor/Aroma, Benzyl Alcohol, Benzyl Benzoate, Benzyl Salicylate, Hexyl Cinnamal, Hydroxycitronellal. MAY CONTAIN / PEUT CONTENIR (+/-): Mica, Titanium Dioxide (CI 77891), Iron Oxides (CI 77491, CI 77492, CI 77499), Blue 1 Lake (CI 19140), Yellow 5 Lake (CI 19140), Red 6 (CI 15850), Red 7 (CI 15850), Red 28 Lake (CI 45410). Isohexadecane, Pentaerythrityl Tetraisostearate, Disteardimonium Hectorite, Dimethicone, Beeswax/Cera Alba/Cire d’Abeille, Glyceryl Behenate/Eicosadioate, Talc, Cyclopentasiloxane, Propylene Carbonate, Silica, Methyl Methacrylate Crosspolymer, Aluminum Starch Octenylsuccinate, Dimethicone Crosspolymer, Phenoxyethanol, Flavor/Aroma, Benzyl Alcohol, Benzyl Benzoate, Benzyl Salicylate, Hexyl Cinnamal, Hydroxycitronellal. MAY CONTAIN / PEUT CONTENIR (+/-): Mica, Titanium Dioxide (CI 77891), Iron Oxides (CI 77491, CI 77492, CI 77499), Blue 1 Lake (CI 19140), Yellow 5 Lake (CI 19140), Red 6 (CI 15850), Red 7 (CI 15850), Red 28 Lake (CI 45410).